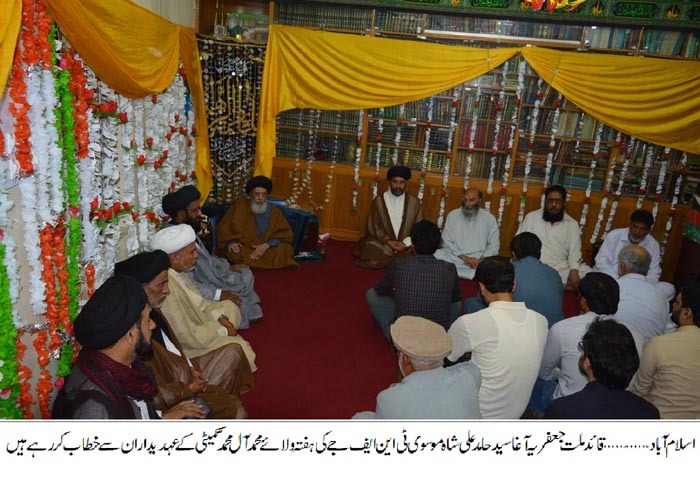 ISLAMABAD, April 13: While declaring the bomb blast in the fruit Market of Hazar Kunji Quetta as a heinous act of the eternal enemy the Patron in-Chief of Supreme Shia Ulama Board and head of Tehreek e Nifaz e Fiqah Jafariya Agha Syed Hamid Ali Shah Moosavi has said that those killing laborers and workers do not deserve to be considered as humans. Government must bring the murderers of martyrs to justice, settle the damages of their families and avoid discriminating terrorists as good or bad and give them exemplary punishments. Respectable institutions, administration, Judiciary and the government are duty bound to keep their differences aside and become an iron wall for the security, defense and stability of the motherland. More than five dozen terrorist groups being awarded with the gifts, medals and garlands of flowers by the rulers is matter of grave concern. Till the time, rulers do not clutch terrorist with iron fist and ensure action on the National Action Plan without compromises, the eradication of terrorism will remain impossible. He said this while addressing to the members of TNFJ’s Hafta e Wila e Muhammad o Aal e Muhammad (PBUT) committee. He also announced to celebrate 7th of Shaban on Saturday as Youm e Noshah e Karbala in connection with the birth anniversary of Shahzada Hazrat Qasim Ibn-e-Hassan (A.S). Agha Moosavi noted that Pakistan has been engulfed by the terrorism for the last four decades and the National Action Plan was formulated after the tragic incident of APS-Peshawar which was followed by the operations Zarb e Azab, and then Raddul Fasaad which continues till date. He said that Pakistan is a peaceful country and none of the Pakistani rulers has ever given a hate or provocative statement against India neither do they took pride in any terrorist attack, nor did they oppress minorities. Similarly, they neither planned for a cowardly attack on India nor gave threatening statements against any country. He stressed that Pakistan’s Prime Minister Imran Khan released Abhinandan as a peace gesture despite Indian aggression. Agha Moosavi regretted on the fact that the flowers sent from the Pakistan side is reciprocated by India with the suicide bombers therefore, Pakistani rulers must remember that India is a poisonous snake who will bite no matter how much you feed him. He said that the foundation of Indian rulers’ politics is based upon anti-Islam and anti-Muslim ideologies. Our motherland Pakistan is faced with Indian terrorism since day one which never stopped if it ever slowed down for while it bounced back with much greater force. Indian behavior has always been aggressive against Pakistan. On one hand, India is involved in terrorism while on the other, she is trying to get Pakistan declared as a Terrorist state. He said that India’s all ruling parties never left any stone unturned in talking against Pakistan while the existing Indian Prime Minister Modi is a grave threat to peace who is responsible for Muslims genocide in 2002 which left 2044 Muslims martyred and hundreds and thousands displaced while Modi also admitted the tragic killing and never expressed regrets or any sign of shame for the bloodshed. Agha Syed Hamid Ali Shah Moosavi further said that in 2015 while addressing at Dhaka University, Modi also admitted that he himself participated in Mukti Bahni and that the new generation must be told that Indian youth was involved in disintegrating Pakistan. On 16th December 2016, BJP celebrated as a day of victory and Modi admitted to break Pakistan by accepting Dhaka fall in the war of 71. Agha Syed Hamid Ali Shah Moosavi said that Modi’s Chief Minister while addressing in the occupied Kashmir boasted of dividing Pakistan into ten pieces while Nehru had laid foundation of terrorism by occupying Jammu Kashmir which continues till date.